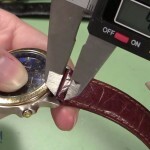 Whether your current watch band is beginning to look dingy or tarnished, or you would just like to give your watch a new look, you can easily replace your metal watch band. 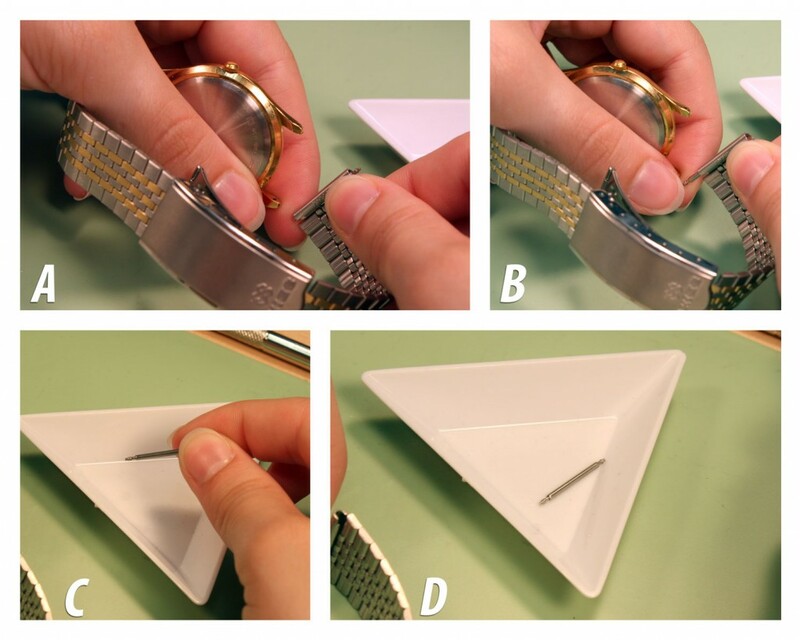 This guide will help you change watch bands in cases with holes in the lugs. How do you know if your watch case does or does not have holes? Check the watch lugs, the metal part that sticks out to hold the watch band. 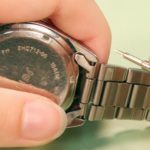 If the lugs look like they each have one small round hole, then you should follow these steps to remove your watch band. 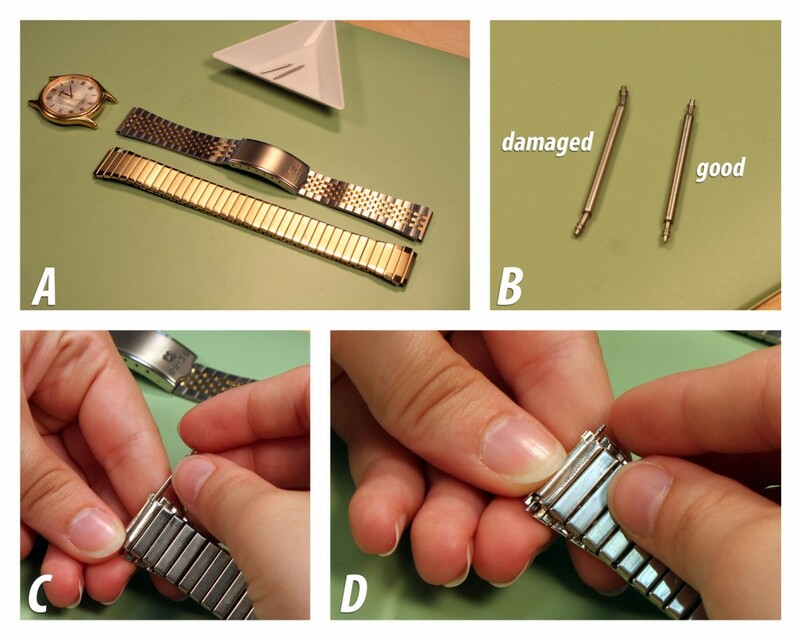 The first step in changing your watch band is to remove the existing watch band. Start by holding the watch so that it is sitting on its side with the watch crown pointing up. Hold the watch case so one side of the band is facing you. Take your spring bar tool and use the pointed end to push the spring bar down through the hole. When you can feel that the spring bar has been pushed down, use a free finger to push the top of the watch band out from under the lugs. When the spring bar and top of the band are free you can easily pull that half of the watch band out of the case. Before you let the first part of the watch band hang free, remove the spring bar from the end and put it in the parts tray in case you can reuse it later. Take your spring bar tool and repeat what you did before. Move the pointed end in into the hole in the case lug and then push down until you can push the band to the side and slide it free of the watch case. First remove the spring bar from the watch band and put it in your parts tray to keep track of it. Then you can remove the watch band and lay it aside so you can remember which side of the watch case it came from. 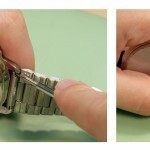 By doing this, you will ensure that the clasp of your new watch band will close the same way as the one on your original band. Now you are almost ready to place the new watch band onto the watch case. 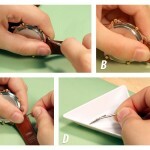 Take one side of the new watch band and determine which side of the watch case it belongs on from the old band. Once you know where one side of your new watch band belongs, grab one of the spring bars and insert it into the first end of your watch band. 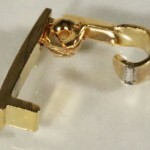 If the previous spring bars are in good shape you can use them in the new watch band. Pick up the watch case and hold it on its side again with the crown pointing to the ceiling. It should be positioned so you can access the side where the first side of the band belongs. Position the spring bar of the watch band in the hole in the bottom lug. Be sure that your watch band’s finished side is facing the same direction as the watch face. Take the forked end of the spring bar tool and position it so that you can push one of the spring ends of the spring bar down so it fits under the lug. 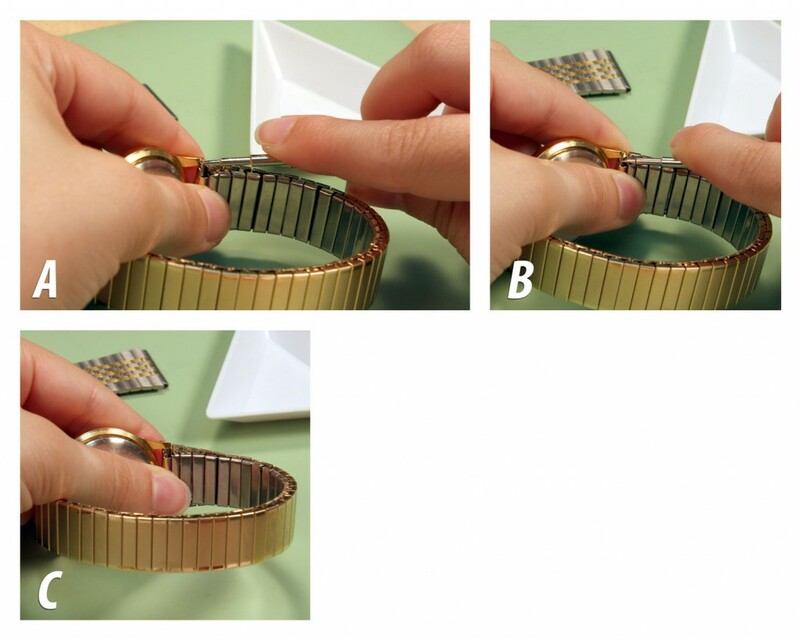 Carefully move the watch band around in the lugs until you feel and see the spring bar pop into place. This will happen when the spring bar finds the hole in the watch lug. Don’t worry if it takes you several tries to get the spring bar in position. Now, turn the watch case so that you can access the other set of lugs and insert the second spring bar into the free end of the watch band. Once the spring bar is in place, position the end of the new watch band between the watch lugs with the end of the spring bar in the hole in the bottom lug. The finished side should be facing the correct way already. When it is in place, use your spring bar tool to push the top part of the spring bar down so it can slide under the top watch lug. Just like you did with the first side, wiggle the watch band around under the top lug until it slips into place in its hole in the lug. Once both ends of the watch band have been securely attached to the watch case, you are ready to wear your watch again with its brand new look.